A wise man once said "you can not have quality time, without quantity time!" An experience on the Oswegatchie ropes course can give you both. Oswegatchie has countless "initiatives" that focus groups on ice breaking, team building, communication, trust, and cooperation. Much like games, these initiatives are fun, active, and will get a group laughing and thinking about their shared experience. A sign that an experience is going well is plenty of laughter! Our low ropes course gives groups obstacles to overcome where team work is essential. These are set at ground height and need a team to over come them. Staff will brief and debrief each experience in order to draw out desired lessons! A high ropes experience is a great way to end the day. It involves putting on a harness and working through challenges set 40 feet in the air. 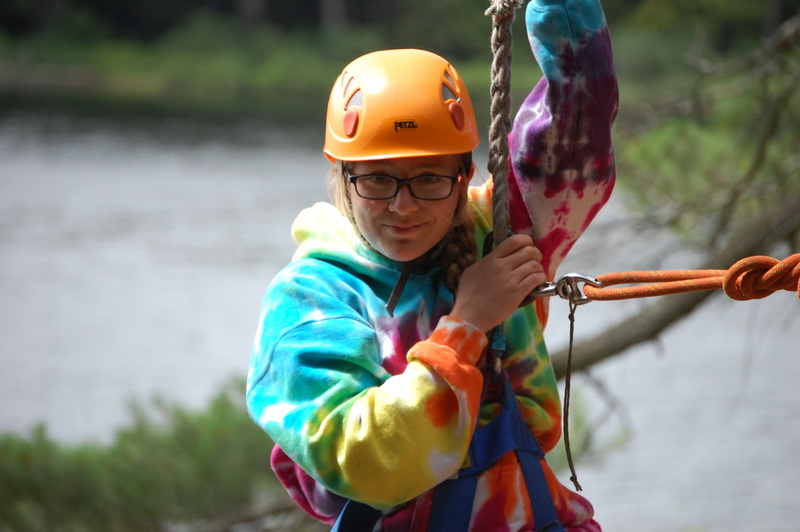 Oswegatchie has 11 elements in our high ropes course, which is more than any group can experience in one day. Each high element has different strengths, such as our Giant Swing, which is perfect for group cohesiveness. The Vertical Playpen is great for 2 person teams. The Zipline is ideal for individual accomplishment. 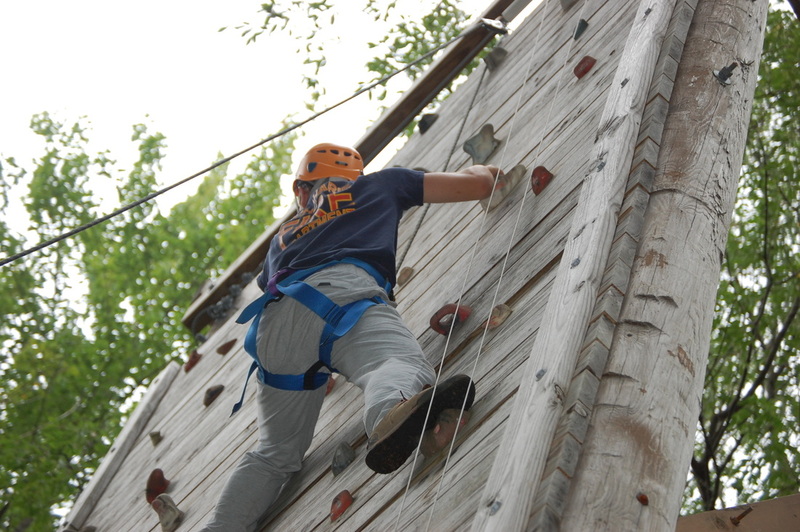 Click here to see program options for a day on our ropes course. Who uses the Ropes Course? Ropes courses are used by every type of group imaginable. The reason for their popularity stems form the fact that they are excellent tools in enhancing the performance, productivity, and effectiveness of people that work together. They also increase levels of self-worth and accomplishment in individuals. The following is a list of the different types of groups that use the Oswegatchie TEAM Challenge Ropes Course. 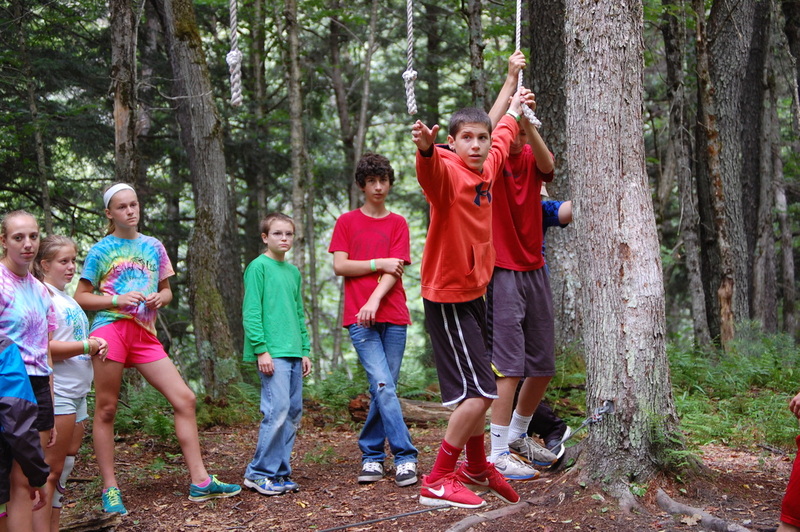 Why should your group use the TEAM Challenge Ropes Course at Oswegatchie? The TEAM Challenge Ropes Course at Oswegatchie is staffed by trained instructors who can provide excellent experiences for any group. They can adjust and tailor the right experience for your group. 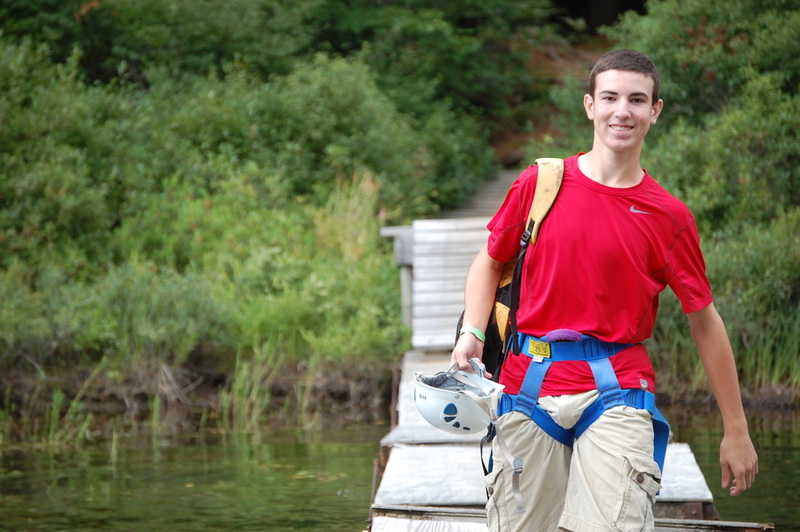 Also, the TEAM Challenge Ropes Course at Oswegatchie is situated on 1200 acres of land between two Adirondack ponds. This setting provides the perfect atmosphere for learning to take place. Our secluded location allows your group to forget the everyday hustle and bustle while working to achieve their goals. The TEAM Challenge Ropes Course operates in nearly all weather conditions. Therefore it is important that you bring adequate clothing. After August it is wise to dress in layers and to bring an extra jacket. Also a rain poncho would be a good idea. For your feet you should wear comfortable, closed toed shoes or sneakers; hiking boots are best. During the months of May and June it is recommended that you bring a supply of insect repellent. Please only wear cotton materials. Do not wear nylon. You can either pack a lunch or buy lunch at our facility. Please call ahead to reserve lunch accommodations. Reservations can be made at any time throughout the year. Our course is open to groups between the months of April and November. Specialized "Winter TEAM" workshops can be arranged at our facility. Please call ahead if your are interested. Lodging is available for those who wish to spend more than one day at the facility. We have a modern, heated lodge as well as various types of cabins available for use. Each group can choose to buy a meal or prepare their own meals in one of two modern kitchen facilities. Other activities available to groups who wish to stay more than one day include canoeing, wilderness hiking, and environmental education workshops. Call (315)346-1222 or E-mail us. The TEAM Challenge Ropes Course at Oswegatchie is a tool used to enhance group development and personal growth through fun learning games, trust initiatives, and low & high ropes elements. An emphasis is placed on group success and on enhancing self-confidence. Place better trust in others as well as self. Did you know PBS made a show at Oswegatchie?